Our goal is for the Center to be open from 10:00 am–5:00 pm, Daily. We have a Center Manager and volunteers who staff the Center. The Welcome Center is a new facility with approximately 1600 square feet. It is handsomely decorated with comfortable furnishings and informative exhibits. There are bathrooms and free Wi-Fi. 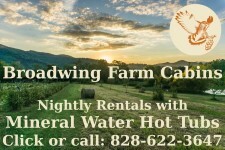 Hot Springs information on lodging, dining, activities and more. Madison County information on our other towns, attractions and more. The Welcome Center has excellent exhibits, from which you may enjoy learning about our fascinating history and the natural world. The Appalachian Trail Conservancy has an informative display, including footprints of local animals. The displays about area history include the following: the Buncombe Turnpike, which ran through town in the early 1800’s; a series of fabulous hotels which were built here; the German Internment during WW1; Cecil Sharp’s Collection of folk songs; and much more.